It’s been a long, dry summer, with plenty of bad news. The Sierras were on fire, we were flushing our toilet with buckets from the shower, and the city gardens and streetscape were full of dead, dying, and stressed trees and plants. It was hard to feel inspired to get outside and work in the garden. But now the local soils are starting to hold some moisture, there’s snow in the mountains, and fingers are crossed for a wet winter. Here are some easy projects to help tempt you back outside. Cool weather and occasional cold nights have brought our migratory winter birds down from the mountains and into our backyards and parks to overwinter. They are also beginning to wear their bright colors in preparation for mating season. Try filling a bird feeder with Nyjer thistle seed (you will need a feeder with small holes). 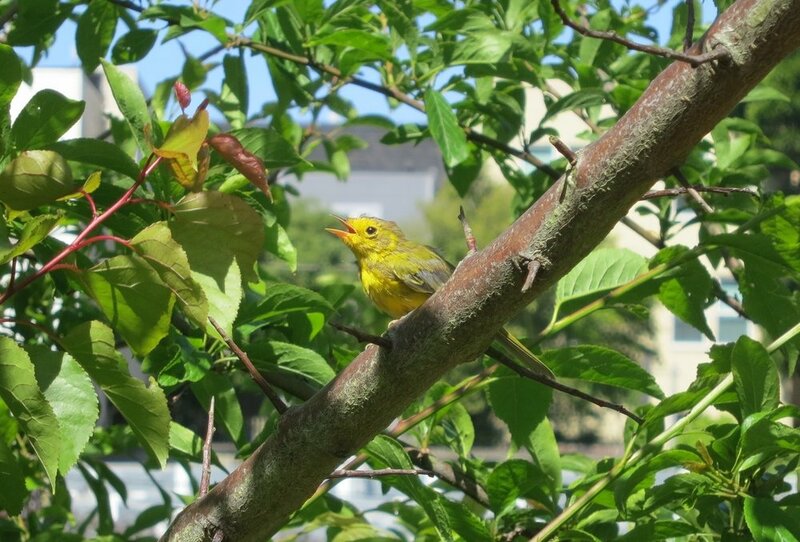 See if you can attract goldfinches, purple finches, and chickadees into your yard. Once these little bright jewels are fluttering around your bird feeder, other birds will come to see what all the fuss is about. You may see white-crowned, gold-crowned, and fox sparrows picking up the dropped seed under the feeder. If you get interested, you can learn so much more at the wonderful bird walks offered at Strybing Arboretum or the Randall Museum. A young Western Tanager enjoying the foliage at GFE. Another simple project to tempt you back outside is an herb planter. Herbs are one of the most frustrating foods to buy, because only a very small amount is needed at a time, and the rest often goes bad. They are not cheap, either! And the fresh ones are so much more delicious than the dried. Try filling a clay pot with potting soil, making sure that it has a hole in the bottom for drainage. Now get starts from the nursery and plant your choice of perennial herbs such as rosemary, chives, oregano, thyme and mint (summer annual herbs such as basil will not grow well now outdoors). Put your pot in the sunniest corner of your garden, deck, or window box. Now you have a good reason to go outdoors! Even a small snip of fresh herbs will liven up your eggs, salad dressing, or roasted veggies and surprise your taste buds. Wood is another good material for a patio or balcony herb planter box. Clockwise from the left, this planter has thyme, catnip, rosemary, and sage. Here’s one more idea to tempt you outside. Even though your garden may have few flowers right now, it’s still fun to cut bouquets. Fall flower arrangements may feature bare branches, berries, colorful leaves, fern fronds, or seed heads. Your garden may seem bare until you put on your gloves, grab your hand-pruners, and actually walk outdoors to look. Then you may find your creativity kicked into high gear by unexpected seasonal beauties. It’s also the very best time of year to add new plants to the garden, and many plants with fall interest or color are available now. You can add something new to the garden in anticipation of future fall flower arrangements. Three of my favorite colorful foliage plants all start with the letter L. Leucadendron, Lophomyrtus, and Loropetalum all have bright, colorful foliage that works well in flower arrangements. Many sizes, colors, and varieties are available in nurseries. They are also all plants that need little or no summer water once established. It’s no accident that any of these ideas would also make good gifts. The holidays can be a time to share love of nature and consume and pollute less. Let’s look outdoors for inspiration.